Update your look with this eye-catching pendant. Crafted from sleek sterling silver, this pendant features a cut away heart shaped design for classic feminine style, and has a crystal encrusted cross at its centre as a contemporary symbol of faith. 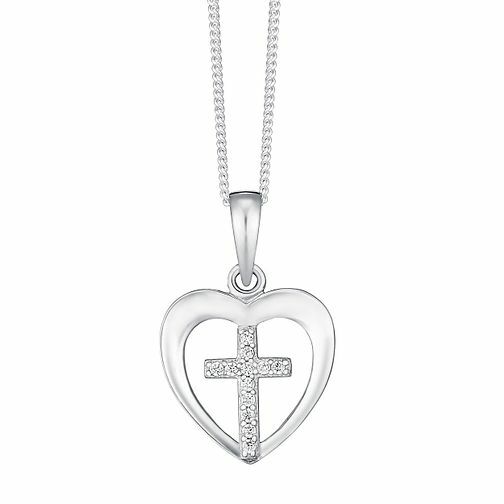 Sterling Silver & Crystal Heart With Cross Pendant is rated 4.4 out of 5 by 7. Rated 5 out of 5 by Anonymous from This product is gorgeous I brought this product online through click and collect. I found the service easy to use and the collection of this product was fast and simple. The necklace itself is a gorgeous design and there is nothing wrong with it. It looks stunning when you have it in your hand and I can't wait to give it to my Goddaughter at her baptism.